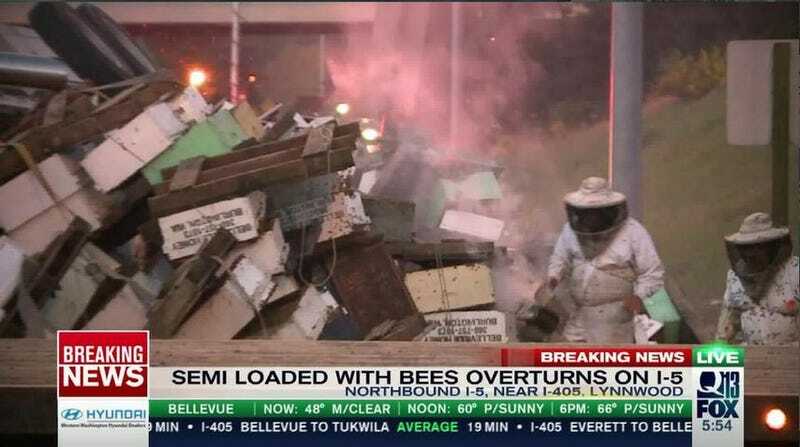 LYNNWOOD, Wash. — A semi-truck carrying thousands of bees overturned on northbound Interstate 5 near I-405 Friday morning, shutting down two lanes of traffic. The truck driver said the accident happened after he blew a tire while merging from I-405 to I-5. The truck was carrying 458 honey bee hives. Many of the bees were killed in the accident. An effort was being made to save as many of the remaining bees as possible. Officials said the bees were relaxed before dawn, but it was clear that they were becoming much more active as the sun came up. The truck driver was not hurt in the accident.